- Total L1 Cache -> ~256KB ? - Total L3 Cache -> 4MB <--- This is the interesting bit I like. They managed to squeeze L3 into the APU! You are mixing Bristol Ridge with Raven Ridge. I think given the A12 9800 price we can assume the price will be like that on raven ridge. Really boring product using excavator and GCN. Watching some videos online it can even handle a decent amount of AAA titles at low-medium 720P at around 30-60fps. Better then what i had when i first got started with the integrated graphics on Intel 945 and ATI 4200 haha. I expect Zen2 to bring 5--10% increase over Zen IPC. I expect 10-15% IPC +5-10% clockspeed. Don't say that to people that expect 5.7GHz clockspeed at stock settings! 40% frequency over say 4GHz that is 5.6GHz, or 60% lower power will land a 39/57W TDP. Those processors are going to be beast! "As Dan Nenni previously discussed in his GlobalFoundries 7nm and EUV Update! blog 7LP (Leading Performance) will offer a greater than 40% performance improvement relative to 14nm or greater than 60% lower power. Area scaling will be approximately 2x and the die cost reduction will be greater than 30%, with greater than 45% in target segments. Initial customer products on 7LP are expected to launch in the first half of 2018 with volume production in the second half of 2018. High-performance computing and premium mobile markets continue to drive adoption of leading-edge FinFET technology, and additional segments such as AR/VR, deep learning, and automotive CPU are accelerating node migration. GF’s leading-edge product offerings are ideally suited for those needing maximum computing performance within a given power envelope and at a balanced cost. 14LPP FinFET is a complete, fully-enabled platform in high volume manufacturing with excellent yield and Performance/Power/Area (PPA). And, 7LP technology is in development with risk production next year. It leverages the solid foundation of 14nm and delivers more than twice the logic and SRAM density, with >40% performance boost or >60% total power reduction, compared to 14nm foundry FinFET offerings. GF is planning a seamless phase-in of EUV and additional platform extensions including performance boost and automotive, similar to 14nm FinFET. Greater than 40% performance improvement relative to 14nm, or greater than 60% lower power. We will have to see which direction they take it. Edit: 7LP(LP stands for Leading-Performance not low power) if that is any indication which direction they are taking this next node. And I explained you why expecting 5.6GHz for Zen2 or TDP reduction to a 39/57W TDP is nonsense. Not only Glofo marketing team is advertising idealized percentages that don't correspond to realistic circuits*, but their claim is for the optimal range of the node, and not a constant that one can add to any frequency achievable by 14LPP. * That is the reason why the graphic accompanying those marketing claims reported frequencies of 8 and 10GHz. They are measuring at the transistor level, without BEOL overheads and other stuff that affect real circuits. AMD’s ‘Epyc’ Design Impresses, Says Canaccord; 7-Nano is Next. Canaccord Genuity's Matthew Ramsay digs into the details of AMD's "Epyc" server chip, and likes what he finds. He's also encouraged by the company's intent to jump to a "7-nanometer" manufacturing process for its chips late next year. Canaccord Genuity’s Matthew Ramsay today reiterates a Buy rating on shares of chip maker Advanced Micro Devices (AMD), and a $20 price target, after reflecting on the company’s presentation at the "Hot Chips" conference in Cupertino, California last month, and his own research on the company’s sales trends. “Overall, while we recognize roadmap execution and competitive risks remain,” writes Ramsay, "we believe risk/reward is still tilted toward the upside." Ramsay spends a considerable amount of time talking about the company’s “Epyc” server chip. AMD made the controversial decision to string together four separate chips in place of one, as shown in the info-graphic at the top of this post. 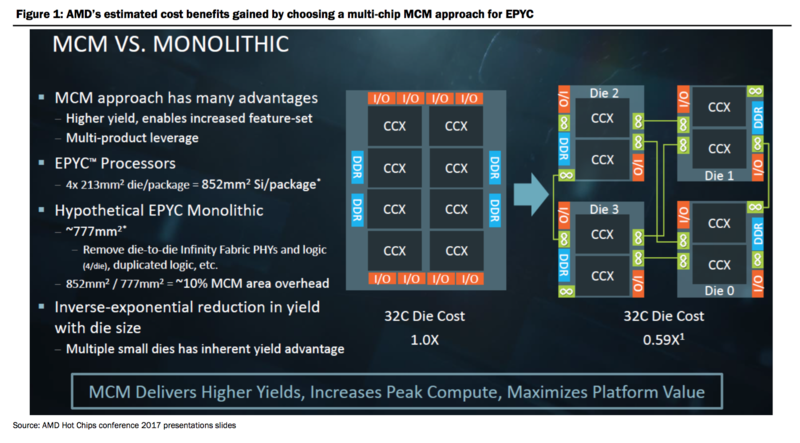 Given cost/yield realities of n- node silicon, AMD chose to design its initial EPYC server products as 4-chip multi-chip modules (MCMs) versus as single larger chips, and this has proven an area of debate in our investor conversations versus the single-die approach taken by Intel. While this design choice has many benefits including lower costs, higher yields and a simplification of the roadmap, we acknowledge there are corner cases where non-uniform memory access latency could be problematic. However, we believe essentially all high-tier software and modern OS kernels are NUMA-aware and believe AMD has only excluded initial EPYC systems from a very small subset of the server TAM through this design compromise. The benefits, however, are substantial in terms of roadmap simplicity and chip yields. In fact, as shown in Figure 1 below, AMD estimates 41% cost savings in a 4-chip 32-core package versus a single 32-core EPYC chip. In addition, important reliability availability serviceability (RAS) features are included in EPYC and leverage AMD's Infinity Fabric enhances system design flexibility and scalabliity – for instance, close integration with AMD's Radeon Instinct GPU accelerators. We believe the Hot Chips talk adds to our recent discussions with CTO Mark Papermaster (and more importantly EPYC customer endorsements) to further dispel the myth EPYC is just four desktop CPUs linked together. While we certainly do not anticipate AMD will compete across the full breadth of Intel’s server stack or at all price points with even close to the same number of SKUs, we do believe early indications of system design (leveraging the infinity fabric) and the 14/7nm Zen core roadmaps will set price/performance points for memory/IO focused workloads such that our estimates of $1.15B in server revenue (or roughly 7% of the TAM) by 2020 are quite realistic and conservative. Additionally, a sensitivity analysis of AMD non-GAAP EPS to EPYC server market share appears in Figure 7 later in this report with 10%+ server share driving material upside to the “at least” $0.75 non-GAAP EPS target set by management. Ramsay looks forward to chips late next year from AMD that may have smaller feature sizes of 7-nanometer, down from 14-nanometer for the current parts, which will bring a boost to performance. Looking forward at the future desktop and server roadmaps from AMD, we believe 2H/18 will bring the introduction of 7nm products followed by a full year of 7nm products across the portfolio in 2019. By taking the roadmap from 14nm down to 7nm in the next generation, we believe AMD's products can have much higher performance and performance/watt versus today's 14nm Ryzen and EPYC roadmaps. Further, we anticipate these new 7nm products will compete with the 10nm roadmap from Intel. Given our view – shared by Mark Papermaster in our recent discussions – that 7nm foundry silicon is roughly equivalent to Intel's 10nm node in terms of realized performance/density/power, we believe another significant shift in the competitiveness of AMD's products versus Intel's will take place in 2018/19, leaving AMD at process node parity with Intel for the first time in well over a decade. We continue to believe investors underestimate the importance of this roadmap development for AMD's second-generation Zen-based products and primarily focus only on nearer-term results. Should AMD execute the 7nm roadmaps in 2018/19, we believe more substantial share gains could result. In addition, industry contacts indicate datacenter customers watch 7nm developments closely under NDAs and we believe AMD has already "taped out" multiple 7nm chips with positive early indications. Ramsay also offers a couple thoughts about AMD’s “Vega” graphics chip, which competes with parts from Nvidia (NVDA). He writes that he was “disappointed,” if slightly, with "the performance and perf/watt metrics” of the GPUs. However, "we do believe Vega increases AMD's higher-tier SAM and crypto-currency demand should help drive solid graphics sales growth near-term and until 7nm Navi GPUs launch in 2018." Our checks indicate solid and continued gradual share gains for AMD Ryzen CPU chips across all five top OEMs (Dell, HP, Lenovo, Asus, Acer) – including important Alienware systems from Dell’s gaming division on AMD Threadripper CPUs. In addition, AMD recently launched Ryzen Pro enterprise-focused SKUs with Dell, HP and Lenovo for 2H/17. Given the much more competitive performance and cost structure of Zen-based Ryzen chipsets versus Intel, we estimate AMD will grow its PC CPU business by roughly 50% in 2017 Y/Y (granted versus very poor results in 2016) based mostly on Ryzen desktop products and also that new Zen-based 14nm products yield a gross margin roughly 10-20 points higher than previous 28nm products depending on product SKU. While we raise our Q3/17 estimates slightly and remain well above consensus for 2H/18 and for long-term AMD revenue and earnings estimates, we believe consensus estimates for Q4/17 and potentially Q1/18 may be slightly too aggressive given tougher gaming console compares and seasonality combined with an EYPC sales ramp we anticipate will accelerate meaningfully during 1H/18 versus sooner given the server adoption cycle and strong early traction with customers and partners. Ramsay is modeling Q4 sales this year of $1.32 billion, and EPS of 2 cents per share. The Street is modeling $1.333 billion and 4 cents per share. For Q1, he models AMD making $1.148 billion and losing 4 cents per share. That compares to consensus for $1.19 billion and 2 cents per share. Talking about this last week's hardware news, including X399 vs. X299 sales, PCIe 4.0 & 5.0, and new peripherals. Speaking with vendors the word on the street is that looking at X299 vs. X399 the venders with whom we have spoken said that the first few days to the first week, depending on which vendor, of sales of the X399 products, related products surpassed the first month of Intel X299 products sales from those same vendors, not retailers, but actual manufacturers. By the way, that volume production in 2018 bit is referring to Zen2 products. Rumors that AMD will use TSMC 7nm process for Navi. Is this the first hint that Glofo 7nm will fail? Given that GPU division and CPU division are completely separate i'm not so sure. I mean at this point they are all basically within each other that the architecture itself matters more. You give the glass half empty view, I'll give the glass half full: capacity. I'm sure AMD has good faith in Zen v2 so they might be securing good initial capacity for it and trying to move as much as possible to TSMC so they can use a node tuned differently for Navi, plus secure more plant capacity. How many lines will 7nm use from GloFo? Only Dresden? What a piece of marketing lies! (iii) They compared fastest 32-core EPYC to older 22-core Broadwell Xeons, which aren't even the fastest Broadwell Xeons available. (iv) The result just demonstrates that EPYC scaling is disastrous. With 45% moar cores, AMD only scores 25% higher in SPECint than older Broadwell. Skylake-SP actually scores about 1.38X higher than Naples on GCC. It's 1.58X higher on a per-core basis. 2P EPYC scores 2360 in specint. 2P SKL does 2930. Only some posts ago, certain people tried to convince me that Navi used Glofo 7nm, because it was the best node. Now I am already reading excuses on how AMD may want to use TSMC 7nm for Navi instead. 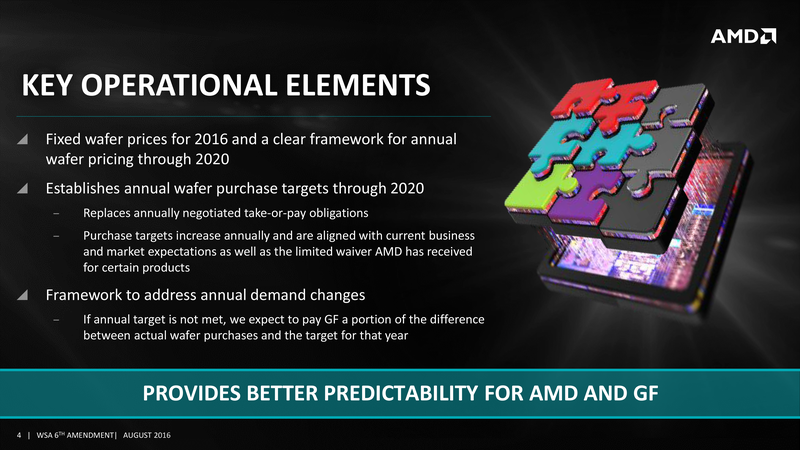 If you remember correctly I mentioned(on more than one occasion) that AMD redefined agreement with GlobalFoundries to use any foundry including TSMC, which Lisa Su made sure to emphasize during the investor day presentation. If CoWoS (chip-on-wafer-on-substrate) is better for AMD GPU's why not utilize it. Having more than one foundry competing for your business is just smart! Also this amended WSA has an economic cost to AMD. AMD has to pay twice: one to Glofo for not using the wafers and another to TSMC for using the wafers. That doesn't look very smart. You also ignored mine. Capacity. AFAIK AMD only has to pay up if they don't fill up the lines. 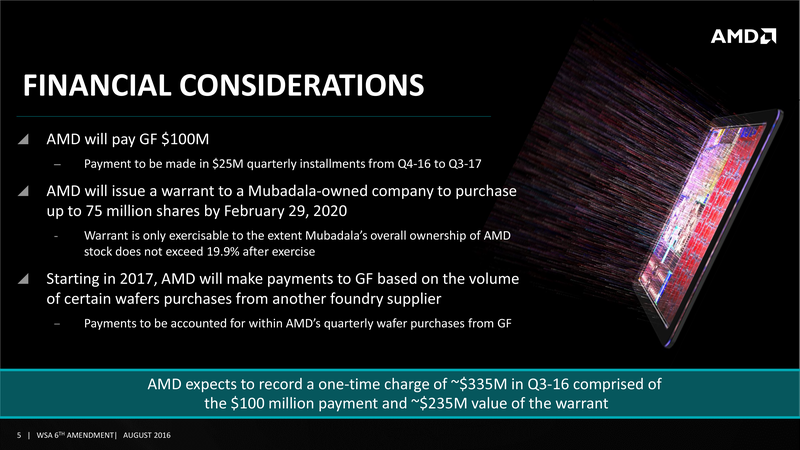 AMD already did paid Glofo $335 millions to change the WSA, plus AMD agreed to "Make quarterly payments to GF beginning in 2017 based on the volume of certain wafers purchased from another wafer foundry." Nowhere it says that payments are based in Glofo capacity. 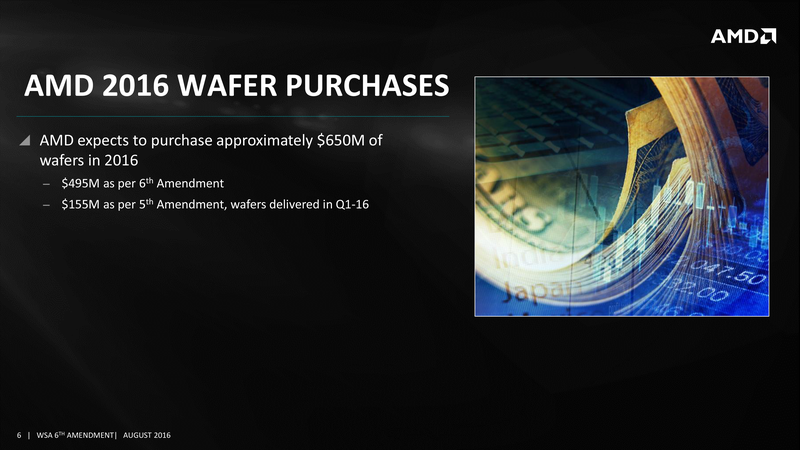 Payments are based in number of waffers purchased from other companies. So, we don't know the details of the terms to understand the impact, if any, for different product lines. ROFL. So, according to you, AMD should wait until GloFo has capacity to build whatever they can and keep themselves from selling products on whatever node they have? What they signed is *precisely* for them to avoid that scenario. You really have a weird understanding of business, Juan. I believe what he is saying is that they would have to pay global foundries if they used TSMC over the contract not that they should chose this or that. I do understand that as well. So, you're also saying AMD should not seek extra capacity elsewhere if GloFo can't provide and keep themselves from selling more because of the agreement? At the end of the day it's just about what is more profitable here. Nothing so stupidly complex to understand. If they make money by seeking another foundry for a product, even with the need to pay GloFo, why not? LOL. What a way to ignore what I wrote!! AFAIK AMD only has to pay up if they don't fill up the lines. is not true, because AMD already paid $335 millions independently of the production. It is evident to me that AMD renegotiated the WSA because Glofo 7nm is not the panacea that some try to sell us. In fact I guess that Glofo 7nm is not suitable for GPUs, and that AMD want to do GPUs on TSMC. Because they had a fix wafer agreement that, depending on extra capacity would need a renegotiation of the price? I do get that I did not remember correctly the terms, but it still doesn't justify why you think the only reason is that GloFo won't be able to produce a node in 7nm that won't satisfy the GPUs. Like I said, I just gave the glass half full appraisal. So, again, you think AMD is better off just depending on GloFo's capacity (as well as quality of nodes)? Let me re-phrase. From what I understand you're trying to get at, your argument goes along the lines of: "AMD can't escape GloFo, therefore the only reason is because their node is crap". Well, I'm telling you: "no, not really". It isn't related to capacity. 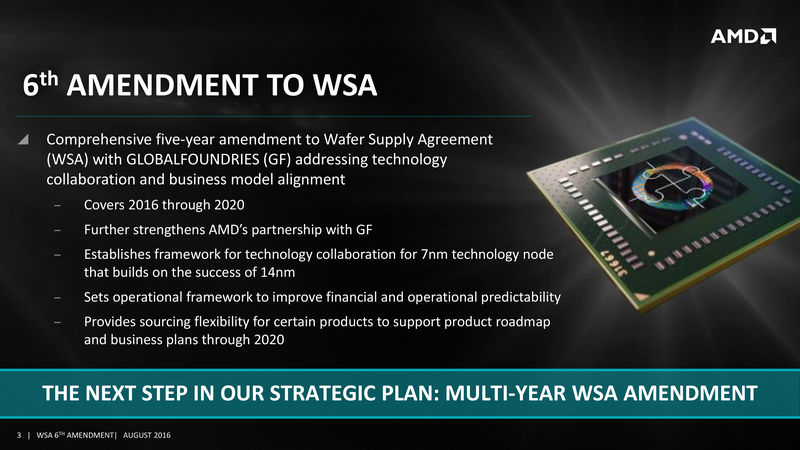 If Glofo production line fas entirely filled with AMD products and AMD needs more production, then AMD would simply order the rest in other foundries, and would not take any penalty because Glofo would be receiving the minimum wafer orders stated in the previous WSA. The only logical reason why AMD renegotiated the WSA, and is paying two penalties to Glofo for breaking the previously signed agreement is because the Glofo process node doesn't have the quality required. I can infer that Glofo 7LP, which is a process derived from IBM foundry technology, is not a valid process for making GPUs¹ and I can perfectly understand that AMD would want to use TSMC for Navi. ¹ IBM foundry never make GPUs, and former Glofo nodes based in IBM technology, weren't used for GPUs. E.g. AMD didn't make GPUs in 32PDSOI process; AMD used TSMC for 32nm GPUs.